Daniel Shapiro, former U.S. 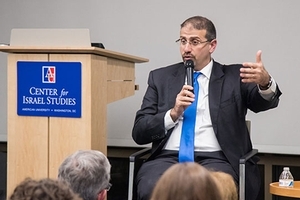 Ambassador to Israel, recently spoke at American University. Israel and the United States have been extremely close allies for years. Yet, "each country faces its own political reality and interests can diverge," said Daniel Shapiro, former U.S. Ambassador to Israel, while speaking at American University's Amos Perlmutter Memorial Lecture on Jan. 22. "We are two separate countries. There is nothing to be afraid of about that fact. It's more a question of management," said Shapiro during the event. "We shouldn't be scared of occasional daylight between us, nor should we pretend it's not there. I think the relationship will be stronger if we recognize it and deal with it honestly." Shapiro, who spoke to a crowd of about 250 people, was appointed by President Obama and served as America's top diplomat to Israel from May 2011 until January 2017. He took office soon after the outbreak of the Arab Spring and Syrian Civil War. Shapiro, who has a master's degree in Middle Eastern politics from Harvard University and is fluent in Hebrew and Arabic, oversaw growth in U.S.-Israeli trade during his tenure as ambassador. He remains in Israel working as a distinguished visiting fellow at Tel Aviv University. The lecture, sponsored by the AU School of Public Affairs and the Center for Israel Studies, is named after longtime political advisor to the Israeli government and SPA professor of political science, Amos Perlmutter. In his remarks, Shapiro described how Israelis vacillate between self-confidence and vulnerability. The country has built a world-class military, expanded relationships with its Arab neighbors, and developed a high-tech economy. Yet, it is subject to waves of bombings, calls for boycotts, and the question of its legitimacy to exist still hangs in the air. "It's a potent cocktail of strengths and challenges," said Shapiro. The U.S. continues to boost Israeli security by providing joint military training, sharing real-time intelligence and contributing to the campaign to defeat terrorism. But disagreements remain about the extent of U.S. military presence in the region and how to prioritize questions of democracy and human rights in the Arab world. "There is not a one-size-fits-all prescription," Shapiro said. In the near future, Shapiro said a two-state solution is not going to happen. However, the goal should be to preserve the solution as a viable option for the future when better leadership prevails. He emphasized the durability of the U.S.-Israeli alliance, saying, "It's always best when we try work together in the same direction, but we have to acknowledge there are some areas where our interests are not fully aligned." He continued, "It doesn't worry me as long as we have leaders who are committed to the fundamentals of the partnership and how to manage through our differences avoiding acrimony and finding a common path. I hope our current and future leaders will be wise enough to continue that approach." At a time when it's easy to get caught up in the day to day debate over the Middle East, Saul Newman, SPA Associate Dean for Undergraduate Education, said Shapiro placed issues in a larger framework. "It was a very thoughtful and balanced presentation," said Newman. "His strategic, yet mildly passionate analysis of the situation, was very refreshing."